Unit size was what I was taught. This is a great event to get in your capitol. It increases PD regardless of cost. Caps start with 25 PD. To buy from 25 to 40 would cost 495 gold. 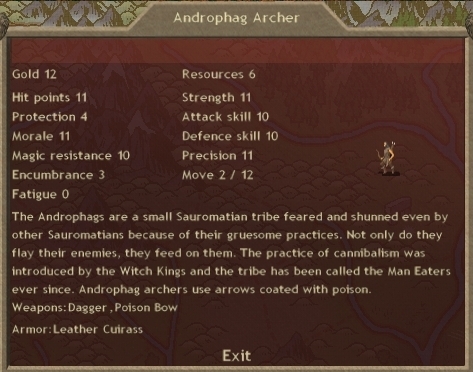 The lone Amazon was killed, so the army now consists 33 Androphag Archers led by a D4 Witch King. TC got the move into my province. Lucky me. 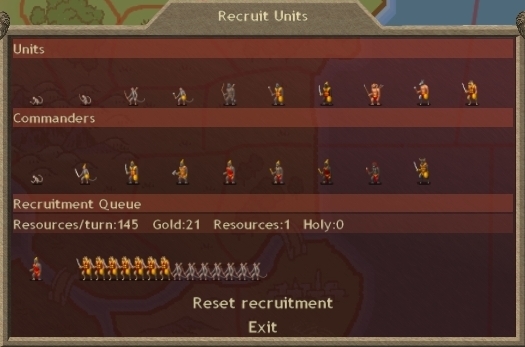 My army is placed in a pretty standard manner. 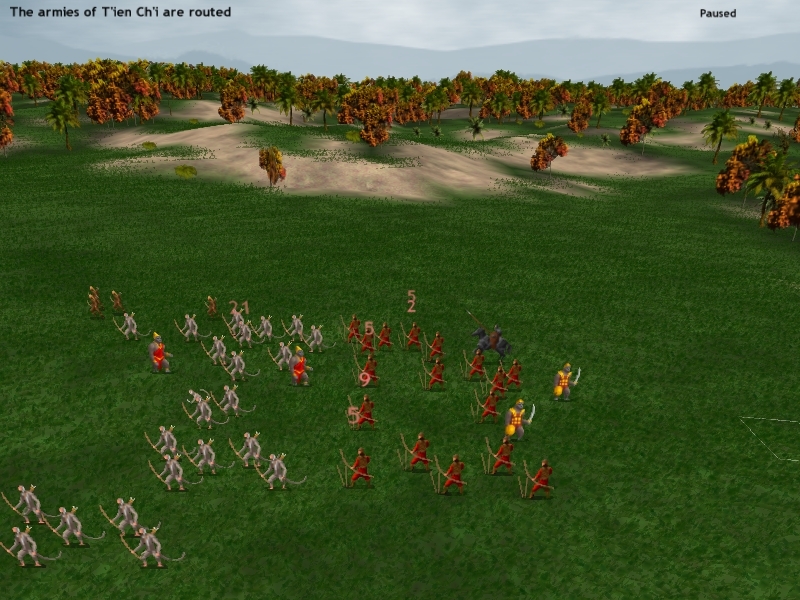 Decoys up front, followed by my offensive melee, followed by my archers. 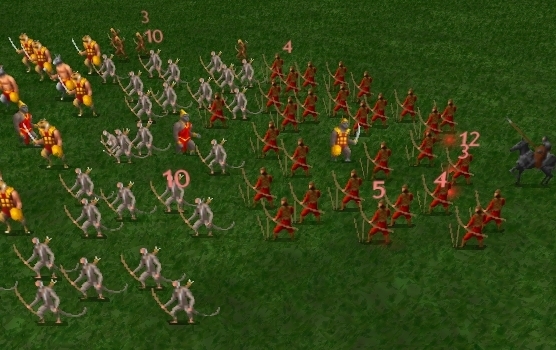 Archers on Fire Closest. 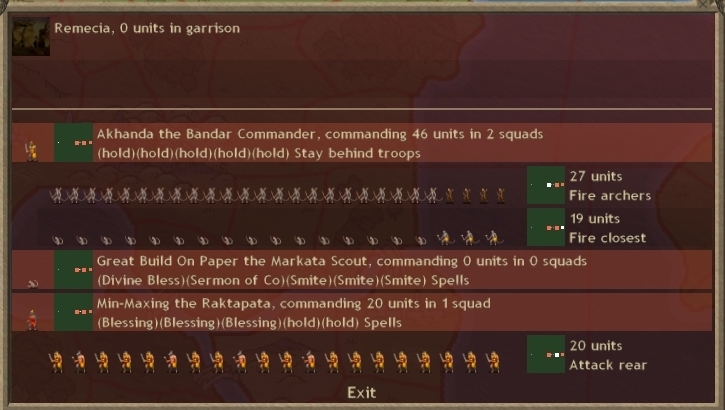 His army is placed more deliberately. I gathered the following watching the battle play out: Shielded decoys up front on Hold and Attack. Unshielded decoys behind them on Hold and Attack. Archers on what I infer might be Fire Archers. 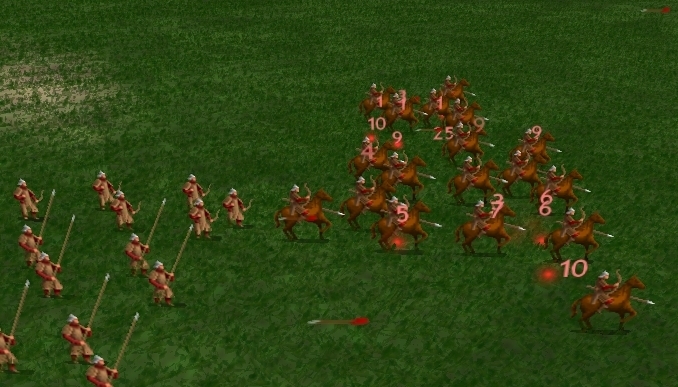 Light Lance Cavalry on Attack Closest (or possibly attack rear or attack archers). Sacreds near the rear on Hold and Attack. A H2 priest for Blessing. 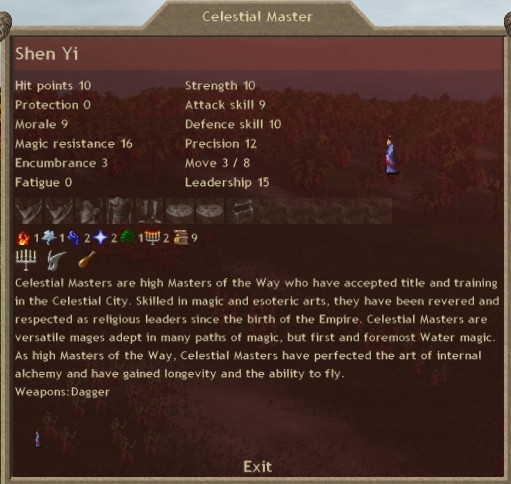 This guy is TC's main mage and one of the best mages in early era. I'll say more about them and show their randoms if I ever fight them for real. This one is just here because he has H2, to bless the Warriors of the Five Elements. Feinne has an Astral 9 bless, which gives Twist Fate and +4 Magic Resistance. Twist Fate negates a single damaging hit. My initial volley hits the unarmored Footmen. 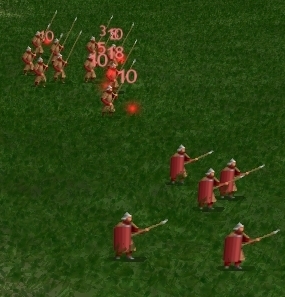 His volley is aimed at my Longbowmen. Round 2 my volley comes down in the middle of his Cavalry. This is disastrous for TC. As on his round 2, they immediately rout. Next round our sacreds are in contact, making them "closest" and a target for my arrows. At first his sacreds are killing more, but that's because mine have to negate his Twist Fate. Once Twist Fate is gone, they get cleaned up as they're outnumbered and being bombarded. Which causes a rout. His archers have been plinking away at my archers the whole battle. But they don't rout fast enough to stop my sacreds from killing most of them. 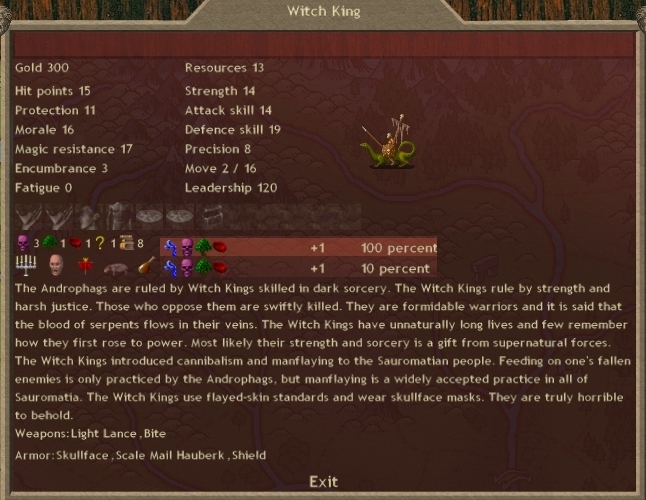 KILLCOUNT assumes the Lankan armies are infinitely powerful, and therefore no accounting of friendly losses is necessary. 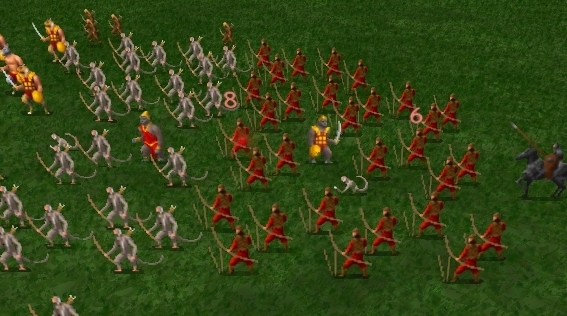 I will admit that 29/30 of my Longbowmen routed, which destroys them as they are mercs. In retrospect, Feinne beat me pretty handily in the scripting battle. His Fire Archers scripting slaughtered my merc group and ignored my archer decoys (who in fact did have ranged attacks = were a valid target for fire archers). 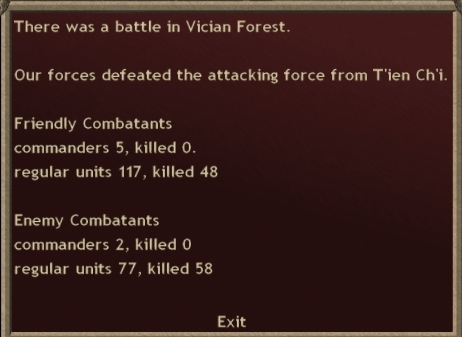 Had I split my archers into Fire Archers and Fire Closest squads, I could have routed his archers in the first few rounds, and the Farstrikers would still be a fighting force. I won because I beat him in army composition. 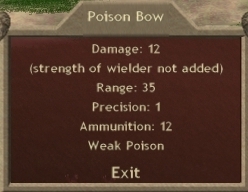 I had the right mix of archers and meatshields to handle his abundance of shieldless stuff. What else did I gather from that battle? Feinne knows his scripting and placement, and he has an S9 pretender. Given his theme, I'm pretty sure what chassis it is, but I'll leave the revealing to the player. So, if that holds (and 99% of the time agreements like that do hold), I don't have to worry about TC anymore. Great! Pity we couldn't have worked that out without the bloodshed. That's great, because I'm pretty sure Hinnom wants to join in as well. Nobody but me borders that province. This is an exercise in Defensive Movement. Most players are familiar with the dom3 concept that the defender moves first. This is technically true, but the concept behind good defensive movement doesn't really have much to do with it. The real idea is: no battles are fought and no provinces change hands, until everyone has moved. And the secondary idea is: a defender can move multiple provinces, or if he's only mapmove 1, he can move from a province not on the border. In other words, the defender's movement can be hidden. The attacker's can't be hidden unless he has a flying army. And that's the idea behind defensive movement. You use the concept that "no battles are fought until everyone has moved" to move where you predict the enemy is going to be. Dom3 players sometimes refer to this as "Mind Reading". 95% of the time you do this by moving through multiple friendly provinces. 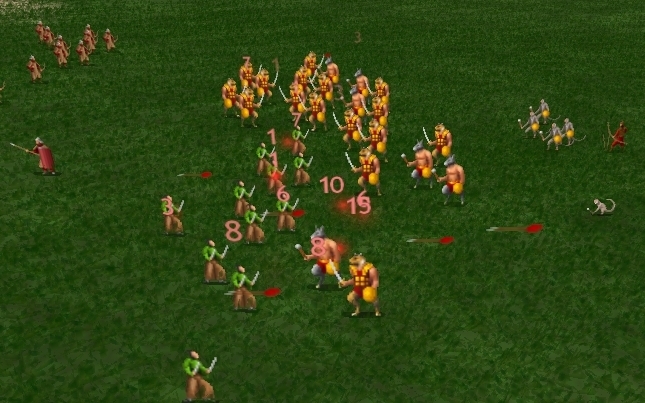 If you are both careful and lucky, your army appears as a surprise, and the resulting rout in your favor is sometimes known as a "Defensive Move Trap". 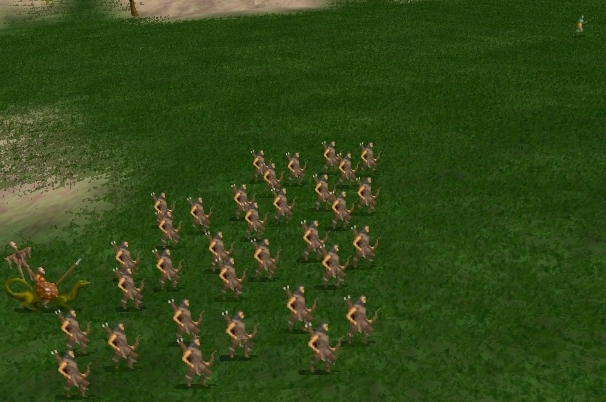 This army is going against Sauro. 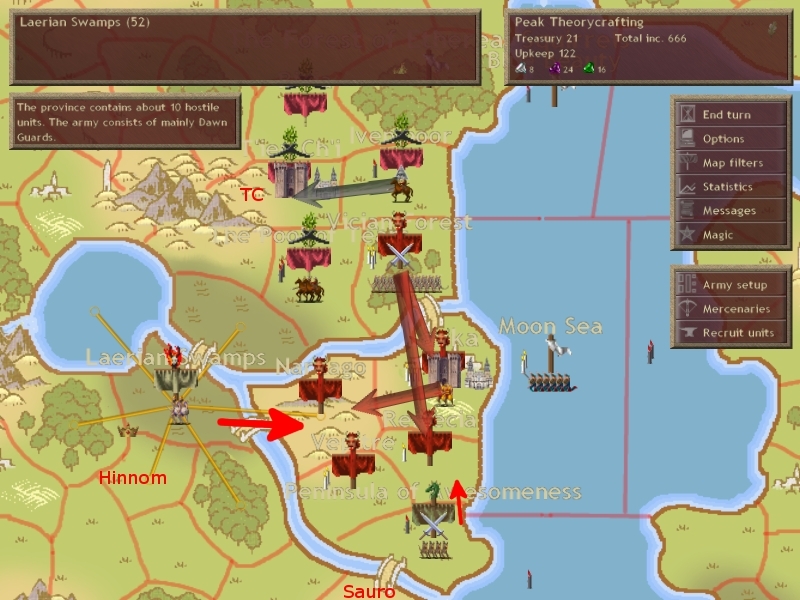 Archer decoys, forward placement of sacreds to close as quickly as possible, and Fire Archers orders on my own archers. This small squad will meet Hinnom's giants. Unfortunately I don't have an accurate count, so let's hope 7 sacreds are enough. Letting the enemy take a province so you have a precise idea of what you're up against is a great idea, except when you only had 6 provinces to begin with.